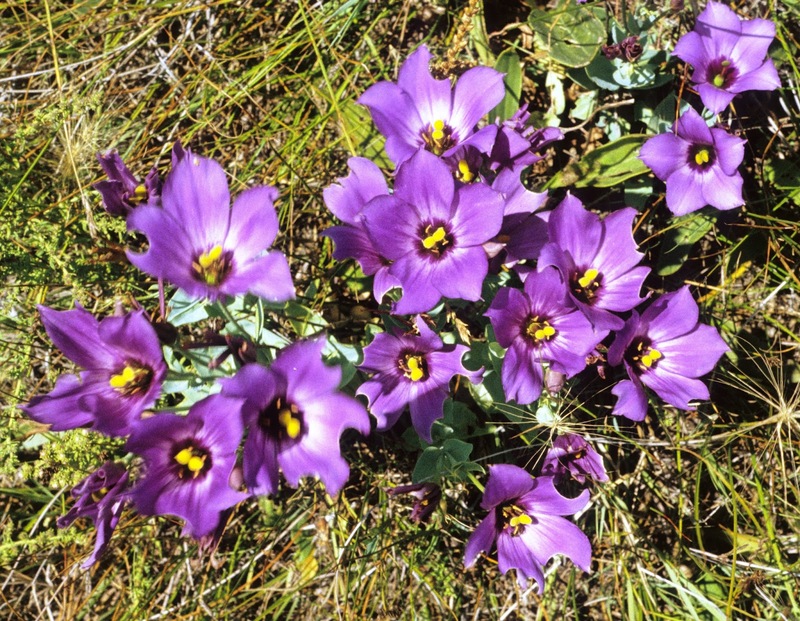 Prairiebreak: Return of the Native: tulip gentian time! Return of the Native: tulip gentian time! I took the picture above 34 years ago in Lakewood. My dear friend Joan Franson called me up to tell me she'd found a colony of tulip gentian (Eustoma grandiflorum) in Lakewood--not far from the intersection of Kipling and Interstate 70: I drove out there with her the next morning and this is one of the photographs I took at the time and later scanned. That story does not end well: the entire area was plowed under the next year for a shopping center (the story of too many flower fields I've loved and admired in my lifetime). I have grieved this colony, and each time I drive by the place they grew (now a parking lot and some shoppes that are constantly changing their brand names) a little twinge of regret tugs at my heart. Fast forward to yesterday! I have seen six or seven colonies of tulip gentian in the West in my day--two of them consisting of only a few plants, and two others have been destroyed by development (in Lakewood) and mining in Boulder County. Occasionally there are extraordinary displays of these at the extensive wetlands in the parks just west of I-25 between Prospect and Mulberry exits in Fort Collins...but my last visit there was disappointing. Astonishingly--these Eustoma were apparently not planted: when some ponds and wetlands were created at this site for mitigation purposes, long buried seed must have come to the surface and last year Jim was surprised to discover this enormous colony of these choice natives. And what a colony! I think these wonderful natives speak for themselves! Welcome back! One of my father's friends donated money to the Nature Conservancy to purchase the only site in South Dakota that contains this flower. Below is the website for the preserve. The person I mentioned above is named John Whitney and the preserve is named for his parents.